“This is not an old family recipe … it’s more of a “darn it, I have to cook 10,000 things already, so let my daughter figure out how to make it” kind of thing. I was the daughter in this scenario. 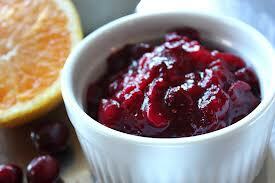 Here’s the story … my mother decided it would be nice to serve homemade cranberry sauce for Thanksgiving. She bought all the ingredients to make 4x the regular recipe. Apparently, she wanted plenty of leftovers to freeze. My mom is a big one for freezing things. Then it got so busy closer to the holiday, that when I showed up I was tasked with the job. She told me she wanted a classic cranberry sauce with that orange-y taste, but had no recipe. The recipe on the bag of berries didn’t list oranges at all, so I decided to wing it. The resulting recipe is what you see below and it turned out fantastic! We (meaning me) make it every year now and I still make extra for my mom to freeze. In a medium sized pot, heat orange juice (including juice from the 1 zested orange), sugar, orange zest on med-high until boiling. Add cranberries. Bring back to a boil, stirring occasionally. Set to simmer and cook until all the cranberries have burst and sauce begins to thicken. Add more sugar to taste. Remove from heat. Sauce will continue to thicken as it cools. Hint: It will look like too many berries for the amount of liquid. Do not add more liquid. As the berries cook down, you will see it will be perfect.